Smudge is a fudged-up show about parenting, relationships, growth, unrequited emotions, cheesecake and theories of probability. New haven theater company is parenting it through next weekend at the Chapel street space they’ve occupied for several seasons now. 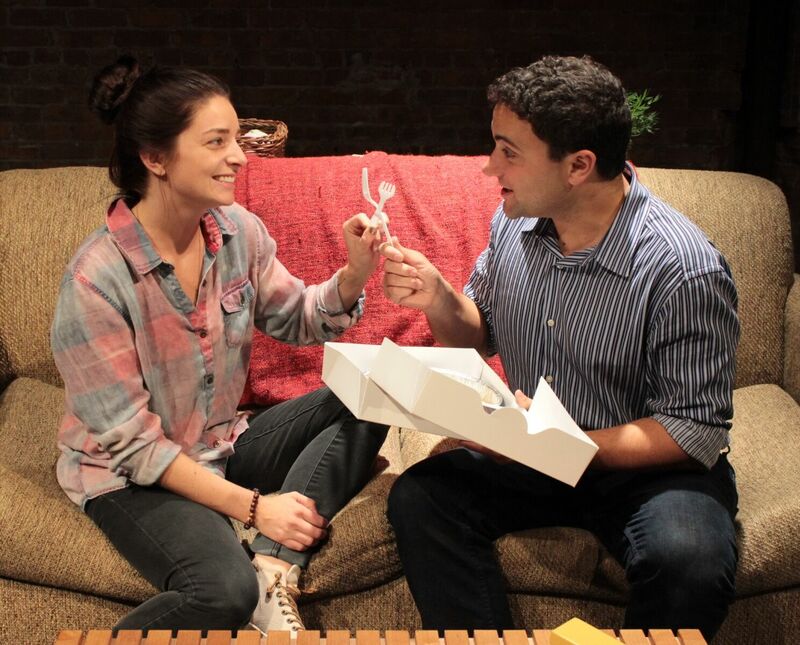 The play, an Off Broadway attraction by Rachel Axler is frequently described as a black comedy. The specific black comedy it resembles is ionesco’s Rhinoceros, only instead of the general populace turning into gray blurry shapes, the lead couple in smudge gives birth to one. Axler, a versatile writer who has written for The Daily Show and Parks & Recreation, alternately treats their offspring as a metaphor, a litmus test, a lightshow and a conversation piece. 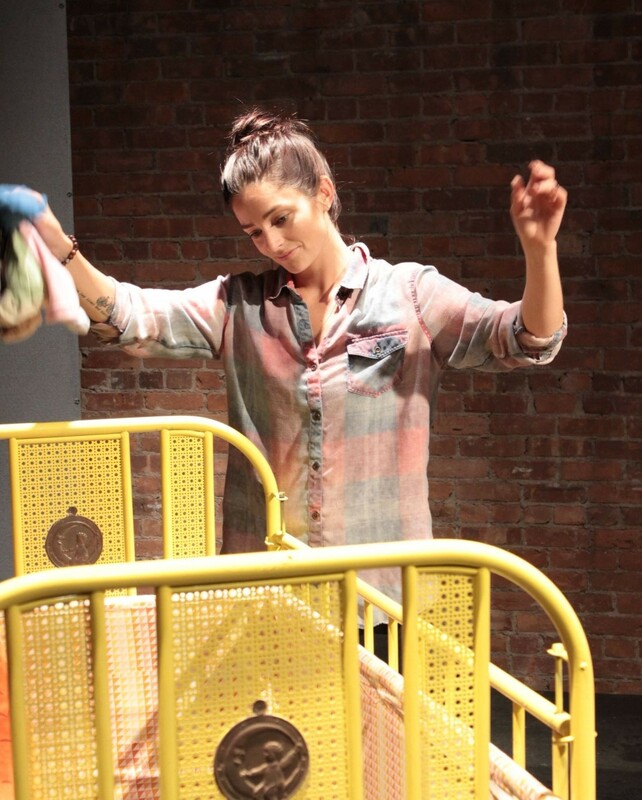 This title character is a child whose own mother describes it early in the play as “looking like nothing in nature” and “Anti-darwin.” But the play isn’t a mere parable about the anxiety and disconnected feelings surrounding childbirth. This concise, 90-minute intermissionless three-character-plus-unseen-infant saga has more (and occasionally less) on its mind than sleeplessness, wonderment and binge-eating. The company, led by director Deena Nicol-Blifford, has a little too much faith in the ability of Axler’s script to shock and entertain all on its own. The sound and lighting effects which animate the unseen infant are constant but rather subtle, the sets basic utilitarian stuff, and the actors let their dialogue out in a leisurely fashion. The production takes place in an odd zone between the unreality of the stated alien-child situation and a blase parlor-drama manner. Nobody gets too worked up, which is fair for a piece that thrives on matter-of-fact reactions to extraordinary developments. But the pacing could be pumped faster and louder without losing that sense of cryptic complacency. On a strictly New Haven Theater Company collective-ensemble community-theater note, it’s tremendously entertaining that the troupe has found a script in which Christian Shaboo and Peter Chenot can play brothers. Shaboo and Chenot are the NHTC actors most often pressed into service as leading men, to the point where they’ve almost become interchangeable. To see them banter and interact as brothers—Shaboo as the shyer, more withdrawn Nick, dealing with the pressures of being the first-time father to a smudge, and Chenot as the outspoken and outrageous elder sibling Pete—almost feels like an optical illusion. As the brawling bros’ female foil, Katelyn Marie Marshall mostly has the inexpressive “smudge” to play off of, practically turning her into a Samuel Beckett character with expressive monologues delivered to the world in general by someone who’s obviously very alone. NHTC is a company that gains extra energy from its members’ cameraderie. Its smaller-scale pieces seldom have the magic or creativity of its ensemble endeavors. Smudge is an insightful play about coupledom and the fraught relationships of any family (there’s a mother character who is not seen but is very much a part of the play, which is otherwise populated by a man, his wife, his brother and a body in a crib.) It’s a shame that a company that runs on community spirit can’t use its considerable flesh-and-blood resources to vitalize a play about family. But Smudge is what it is—a crystallized small-cast New York drama of inwardness and isolation and limited (yet intense) interaction. The script here is the thing, not the energy of the players. And that script is purposefully offputting.